Be the first to share your favorite memory, photo or story of Isabel . This memorial page is dedicated for family, friends and future generations to celebrate the life of their loved one. Isabel Santiago-Flores, 83, of Milford, NH, passed away peacefully, surrounded by her husband, Gilberto Amaro Soto, her nieces; Carmen Soriano and Maria Soto, her nephews; Carlos Soriano and Shane Sylvester, and her friends; Peggy Nassif and Laura Morrissey, on February 8, 2019, at the Community Hospice House, in Merrimack, NH. She was born on July 8, 1935, in San German, Puerto Rico. 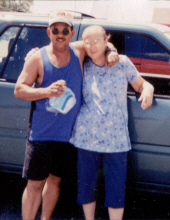 Isabel was a devoted, loving and caring wife to Gilberto for 35 years. Isabel was a graceful, religious and spiritual lady and loved by everyone, old and new friends. She will truly be missed by all of us because she has touched and blessed all of us with her love. Isabel had a few jobs and was a hard worker. Her recent jobs were Burger King at the Pheasant Lane Mall, in Nashua, NH, Hitchiners Mfg. Co. in Milford, NH, and the Navy Exchange in Ceiba, Puerto Rico. Besides her loving husband Gilberto, Isabel leaves behind many nieces, nephews and one cousin, Cookie Soccoro, that still lives in Fajardo, Puerto Rico. God bless you Isabel, you will be missed, until we meet again. To send flowers or a remembrance gift to the family of Isabel Santiago-Flores, please visit our Tribute Store. "Email Address" would like to share the life celebration of Isabel Santiago-Flores. Click on the "link" to go to share a favorite memory or leave a condolence message for the family.